Jio Summer Surprise Offer Details: India literally loved every moment with Reliance Jio and the telecom base in India grown multiple times post announcement of offers by Mukesh Ambani. The competition for other companies seems to be getting denser with the introduction of Jio Summer Surprise offer exclusively for loyal customers of company. During the early months before official launch, Jio came up with secret offer for only customers purchasing the device manufactured by company. During the secret offer, there was no limitation of data usage and every customer gets unlimited data daily. Sometimes usage from a single SIM exceeds 50 GB per day because of great transfer speeds. Later as the user base started growing, Jio introduces unlimited data with 4GB high speed capping which was lately reduced to 1 GB. During this time Jio was actually testing the actual capabilities of the server in the most difficult situations. By this time the demand of 4G VoLTE handsets increased in India multiple times because of free data offerings. From 1st April 2017, Jio decided to put a stop on free users of services. Now the customers got introduced with service named Jio Prime which entitles one to enter the prime club of loyal customers. One need to pay 99rs FRC (First Recharge) and then the services will continue to be cheap for the next 1 year. After introduction of the basic plan, Jio SummerSurprise Offer came into the market. 1 What is Jio Summer Surprise Offer? It’s the offer to allow users get data recharge for around 101 rs per month (Recharge to be done of 303 rs). This plan is not valid on low value recharges of 149 rs and below. One need to first join the Jio Prime membership and then a recharge of 303 rs. 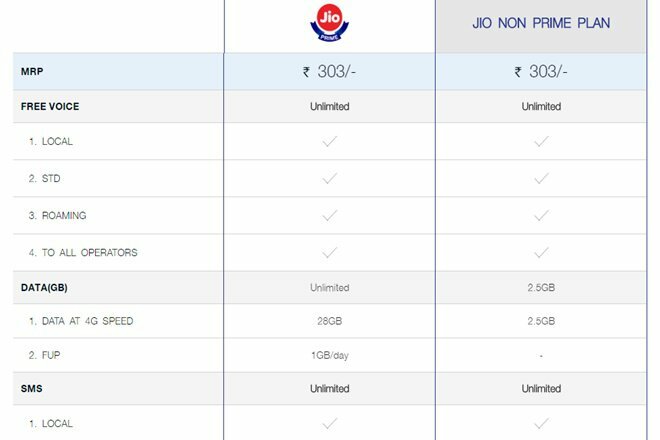 Jio Prime membership will not give you benefit of data or call services. You need to recharge with data pack thereof. After recharging with 303 rs in April, you will get complete three month free services on the existing plan. For example, If Mr. A recharges with 99rs first and then 303 rs on 4th of April, he will get free services of 1GB per day data and calling services till 4th July 2017. Before recharge of 303rs, user shall not be able to access any type of data or calling feature. If someone recharged before 31st March with 303 pack and joined Jio Prime Membership as well, he would be able to avail free services under Jio Summer Surprise Offer till July 1, 2017. If someone recharged with 499/999 plan instead of 303, he would receive 2 GB data per day absolutely free for next 2 months as well. We are still awaiting a confirmation from Jio whether the plan of 999 rs which has 60 days validity will get 90 or 180 days validity. However, it appears that the company is only offering it for 90 days. “Every Jio Prime member – when they make their first paid recharge before 15th April using Jio’s Rs 303 plan (or any higher value plan) – will get services for the initial 3 months on a complimentary basis. Your paid tariff plan will be applied only in July, after the expiry of the complimentary service,” Reliance Industries Chairman Mukesh Ambani said. Those customers who already done recharges of 303 rs will receive the benefit thereof. What if I had done a recharge of rs 149, now can i apply for thisnew offer by making another recharge of rs 303? Yes, you just need to recharge with that plan and you will be eligible to get this Summer surprise offer. Did you try ? @ Harender Singh ? If you are a prime member already and recharged more than once before 31st March with two different packages like 303 and 499, from April 16th till 30th July you will get 2GB data daily. If you have recharged only for Rs 303, you will get 1Gb data daily. As explained by the Jio General Helpline, the summer surprise period of three months will start from April 16th and will end on 31st July. During this time your already recharged packages wil remain untouched. But the highest package that you recharged by April 15th 2017, will determine your daily quota of data during this 3-month period. SO, if you have recharged only Rs 303, you will get daily 1Gb of data from 16th April to 31st July, and if you have recharged for Rs 499, you will get 2GB data daily. And in case you have recharged multiple times with different packages, the highest daily data rate among those packages will be applicable during this summer surprise timeline. How much data will I get per day if I reacharge Rs 499/- in the summer surprise offer? 1GB or 2GB? Sorry, it will be till 30th June and not 31st July. The recharges that someone has already done will come into effect from 1st July 2017. If I already recharged 499 shall I get 2gb per day? You will get 1GB daily till 15th April. And 2GB daily from 16th April till 30th June. I have already recharged rs 499 plan so will i get 2gb data per day in Jio summer surprise 3 months? Yes. You will get 1GB daily till 15th April, 2GB from 16th April till July 31st. And your 499 recharge will start after that, i.e. from 1st August. I have recharged with rs:149/- along with jio prime..in last month (march) but how would I get jio summer surprise offer..? & isn’t my 149/- plan going to waste…??? I have recharged 99 on 20th marrch but i haven’t recharge 303 or any plan till now. If i take 303 plan on 12th april, will i get free service till 12th july? What will happen if I recharge with 499 plus 999 will I get 2 GB limit plus 100 GB of data? BTW, why are doing 2 recharges at the same time? On my Jio app, when you select more than one recharge at same time, the cart shows total items selected plus summer surprise offer given with highest recharge. So this means summer surprise offer will be only of one of three ie 1gb/day, 2 GB/day or 100 GB- over 90 days, depending on the highest recharge value, starting from 16th April 2017 for 90 days.